Provides highly polished “ingredient quality” water for drinking and cooking. Reverse osmosis systems filter out extremely small particles that can slip through less sophisticated drinking water systems. 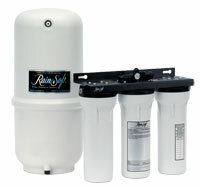 The combination of three filters – pre-filter, RO membrane and post-filter – address almost any water quality concerns. Installs conveniently under your sink. Water enters the system inlet valve. Water is forced through the prefilter cartridge that takes out microscopic particles and polishes the water prior to entering the reverse osmosis membrane. Water then enters the reverse osmosis cartridge where it is filtered through a spiral-wound, semipermeable membrane. The resulting highly filtered reverse osmosis water enters a storage tank. Your reverse osmosis water receives a final polishing through the systems carbon block post-filter, and dispensed through a dedicated RainSoft drinking water faucet.